Everyone knows that Hasbro has long been a staple in many homes. We have all grown up on their games and now are kids are doing the same! Their games differ in range by type, age, and skill level - family games, toddler games, and more! We were sent the games The Games of Things and Cirkis, one for me to play with adults and one for the kids and I to play together. 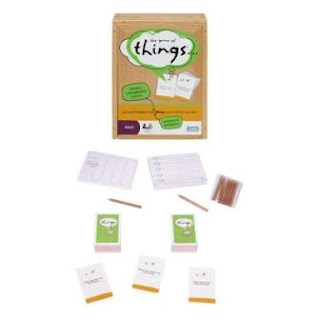 My friends and I played The Game of Things on Thanksgiving and I've played it on a few other occasions with a couple other groups of friends - this game is funny and can be kinda dirty - depending on who you're playing with! 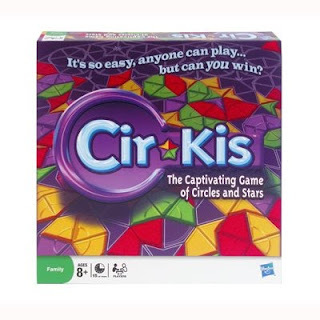 Cirkis is so fun and the kids have each beat me on a couple of occasions! I've beat them a couple of times too! We tend to go back in forth in games like this, taking turns being the winner. Not purposely though - I haven't let the kids win a game since they were really young. You have to learn sportmanship, and boardgames are a great way to do so! 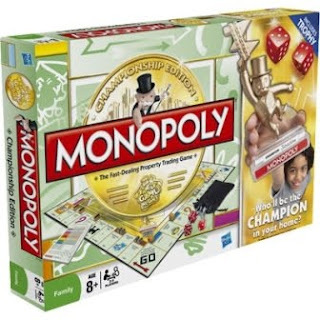 One winner will win the game, Monopoly Championship Edition for their family! To enter, head to Hasbro and tell me another game you and your family would love to play! I would like yahtzee! I haven't played that game in forever! candy land dora the explorer! I like the TRIVIAL PURSUIT FAMILY. I have allways wondered what CANDYLAND would be like to play ,(with the grandkids of course! We are a game playing family! game of Trivial Pursuit Family Game! I would love to play the Monopoly The Disney Edition Property Trading Game, it looks like fun and my daughter would really be interested in playing this version. Thank you so much for such a great giveaway! I like Boggle and Scrabble. I think my granddaughter would like Candy Land Dora the Explorer since she's such a Dora fan. Battleship is one of my favorite games ever! My family would love Trivial Pursuit... I haven't played that game in years! I think we would love to play the new Pictureka game. It looks like so much fun! My kids love playing Candyland. We would love playing Hungry Hungry Hippo - it's so silly but so much fun! My daughter would love the Dora Candyland! Trivial Pursuit Family looks really fun. I like playing Rook as a kid and I think my daughter would like it also. The transformers game looks really cool! I subscribe to rss with google reader! I have to say Candyland. I bake a lot, and recently baked a Candyland cake. I wish I knew how to post a pic of it, it was amazing. I'd love the Trivial Pursuit 25th Anniversary Edition. I also like the Giraffalaff Limbo game. I think we would like trivial pursuit family. Thank you. The Trivial Pursuit 25th year edition looks like a game that our family would enjoy. My kids have mentioned that they would like MONOPOLY City. I have to agree that it looks like a fun game. I would love to have Trivial Pursuit. Thanks! My little niece is getting old enough for CANDYLAND. I think she would love it and learn!! We have always enjoyed playing Yahtzee. My family would love MONOPOLY City! We'd like Trivial Pursuit, 25th Anniversary Edition. My family would enjoy the Electronic Trivial Pursuit. I would love to have Clue: Secrets & Spies. We would enjoy Trivial Pursuit. My family would like SCRABBLE Brand Crossword Game PREMIER WOOD EDITION. We would love Aggravation-we call it Dirty Marbles! The new Pictureka game looks like a lot of fun and I'd love to try it out. thanks for the giveaway. My granddaughters love littlest pet Shop & LITTLEST PET SHOP MALL MADNESS would be perfect for them. We would love to play Scrabble. We would love to try Trivial Pursuit Family. Thanks for the chance. I would love to play Pictureka!! Monopoly Disney edition...I am going to be making our reservations for Disney World soon...I love Disney! We would love to play Pictureka! Our family would like the OPERATION SpongeBob SquarePants Edition game. Another of our favorite games has always been Sorry. I am subscribed via email as shescontests@gmail.com. Candyland would also be fun to play! I'd like to play Battleship. I would love to test my trivia skills with the TRIVIAL PURSUIT Totally 80s Edition Game. Trivial Pursuit has always been a favorite! Candy Land is the BEST! I entered the Dean's Dip giveaway! We like to play Trivia Pursuit. Clue Secrets & Spies sounds good. I'd also like to try Monopoly city! I think the new Scrabble Slam sounds like a really fun card game! I'm entered in the Popcorn Factory giveaway. We would love Clue. Thanks! we would like to try the CRANIUM - Wow. We would love to try GUESSTURES, thanks! I would love to try the Pictureka game! Our FAmily loves to play Yahtzee. I would love to get the Monopoly City though! thank you! We want to try Sorry Sliders. I would love to try Scrabble blast, I love the original. Another Hasbro game we would love to play is Cranium - Wow. We love board games at our house. Thank you for the chance to win. I would love to try Pictureka.